August Strings: Sheet Music, Engraving, and Publishing. With outstanding attention to details, we try to make every page of music as perfect as possible. Combine it with good taste in music, affordable prices, and great customer service. 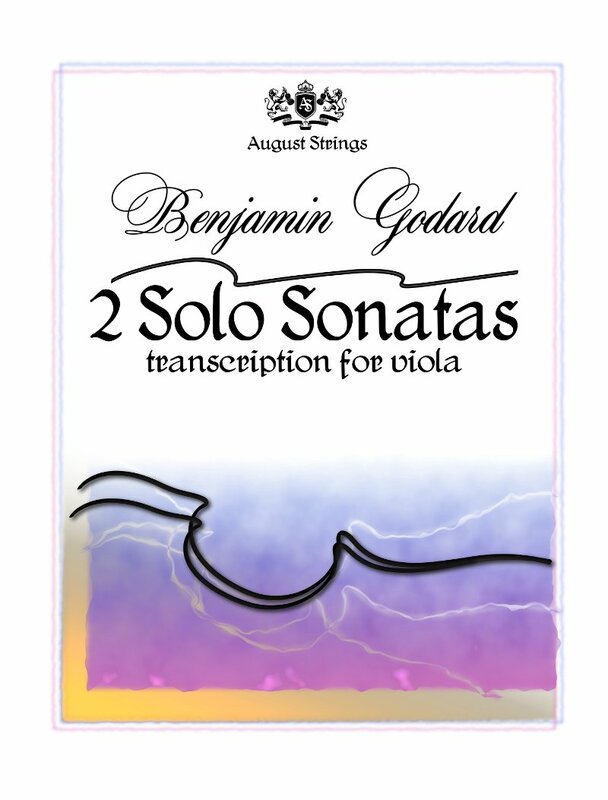 Benjamin Godard's solo sonatas are the rarest example of music written for solo violin during 19th century. They combine baroque traditions with romantic stylistic and melodic language. These transcription fills the gap in solo viola repertoire of that period. If you would like to order a PDF version in A4 or US Letter size, please contact us directly. New challenge for advanced players! 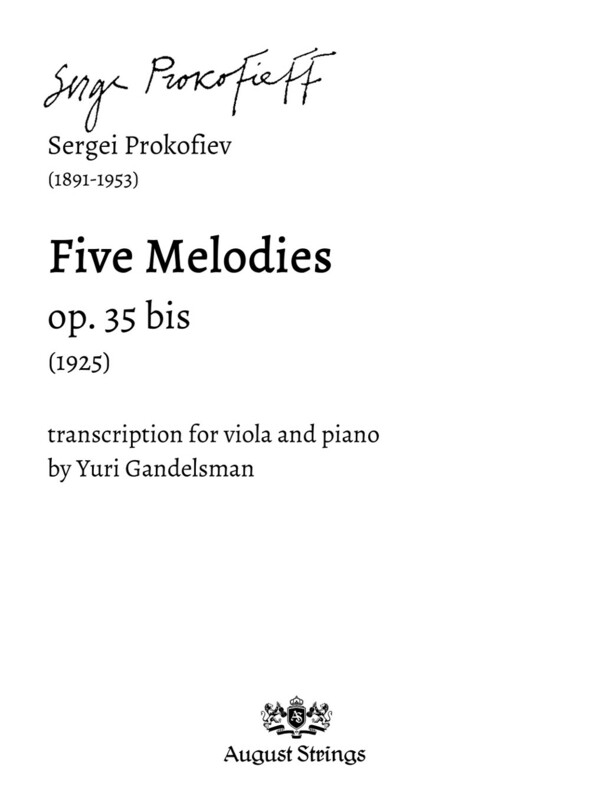 Five melodies by Prokofiev, transcribed for viola and piano by Pr. Yuri Gandelsman. Please contact us directly to order sheet music. Sorry for the inconvenience, the issue will be resolved soon. For delivery outside the United States, please contact us directly for a personal invoice. Come check again soon, as we are currently editing and preparing for printing or electronic publishing more titles that are listed without the price! Through our career as performers, we often needed to transcribe music, make arrangements and transcriptions for viola and other instruments, create parts from the score. To do that, we learned how to use notation software, and how to create professionally looking and easy to read scores and parts. We are proud of our services completed for Novosibirsk State Theater of Opera and Ballet, Novosibirsk Academic Symphony Orchestra, Novosibirsk Kamerata, Filarmonica Quartet. The biggest job we have done was creating a score and parts of opera The Revisor by Y. Dashkevich for Novosibirsk State Theater of Opera and Ballet. Our clients in the United States include such well-known musicians like Yuri Gandelsman, Csaba Erdélyi, Danilo Mezzadri. We offer engraving services for an affordable price. The base price is $0.20 per single-staff measure or $4 per page (excessive marking and/or overall complexity might increase the price). However, we quote each score individually, depending on exact amount of work needed to complete the job, thus often the individual quote is lower than the base price. Years of experience allow us to work fast. Contact us to check availability and discuss your project. In 2016, we decided to extend our services to publishing, as we created few transciptions and arrangements that we thought are worth being published. After a carefull research, we could not find any better solution than to start self-publishing. The next logical step was to offer publishing services to others. We are looking for music for strings, solo or in ensemble, and we would be happy to discuss the publication of your composition or arrangement with us. As we just starting, we offer great discounts on our services which can iclude: engraving the score and parts from the manuscript, editing the score for a better readibility (page-turns, markings placement), preparing source file for printing, cover design. We prefer music to be printed on 9"x12" natural color paper, but we would be happy to help with custom orders as well.